Grandpa would let you steer the pickup no matter how old you were. Grandpa was up for a fishing trip at any time. Even if you were doing something that was work, it was fun with Grandpa. We would go out with him and “help irrigate” by making new ditches for the water with the pickup, often getting stuck in the process. Then we would “rrrrrrrooohhhm” back and forth until we either got out or got more stuck. If we got more stuck, then we would shoot the gun in the air until my Dad came and rescued us. Dad sure got a lot done on those days. Another good way to spend time (and get us out of Mom’s hair for a few hours) was hunting rocks. Now, Grandpa knew to look for agates. Us kids were usually running around, getting cactus in our feet, and picking “good rocks” that were anything but agates but that we loved and treasured and carried home and insisted be kept in the porch. And Grandpa was always there to admire all of them. 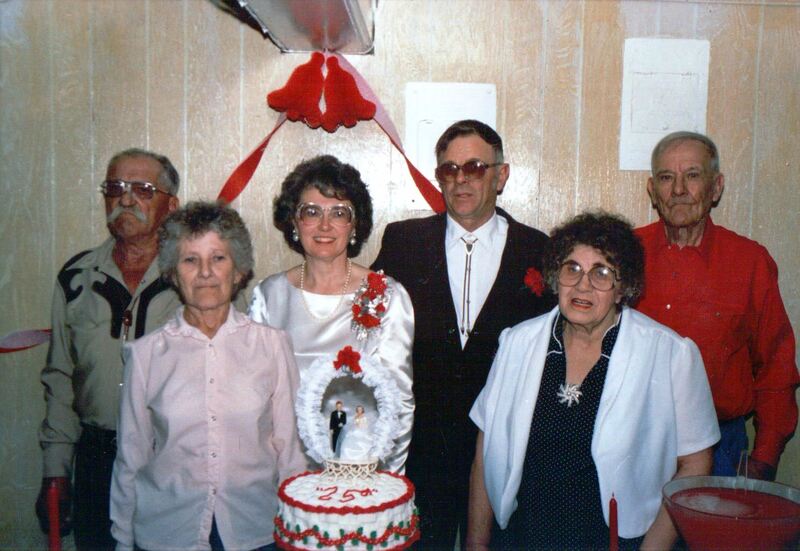 The picture below is from 1989, Mom and Dad’s 25th Anniversary celebration. Their anniversary is in December but that is always unpredictable as far as weather is concerned. 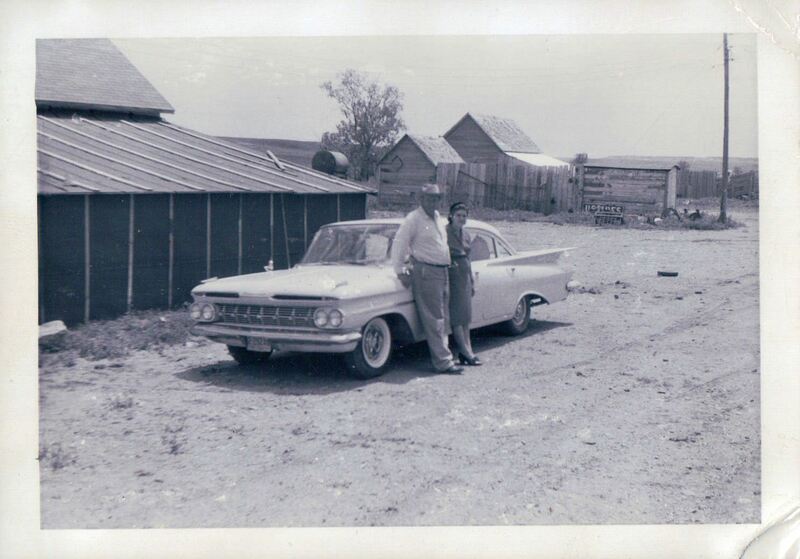 Grandpa took me out in the pickup one time to help feed cows, I must have been three or four. Uncle Curtis was along too, and when we were up by a dam in the pasture, Uncle Curtis went to get out of the pickup, and I followed him and he didn’t know it, or maybe we were getting back in, but somehow I got my thumb slammed in the door. Of course Grandpa offered his immediate remedy to everything, which was to spit some tobacco juice on it. I believe I declined. Back to the house we went, and I even got taken into town to see the Dr. I don’t believe anything was seriously wrong, just really bruised and skin scraped off, and I got a wooden flute at the Dr.’s office for being good (that is what I remember MOST about the day). And then the nest time we were out in the pasture, Grandpa told me that draw (low place between the hills) was now called “Dumb Thumb Draw.” And so it was called for the next 25 years, at least. 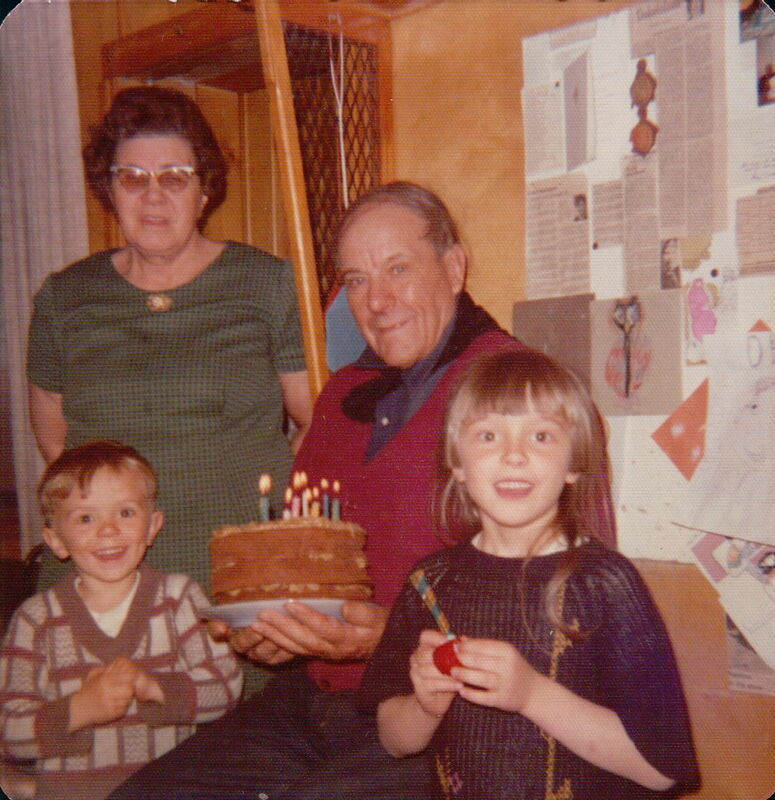 Below: Celebrating my birthday and Grandpa’s birthday, which were only 9 days apart.1976 I think. Grandpa died at age 99 in 2003. He had been married 73 years. What changes he saw in a lifetime. What memories for a kid. 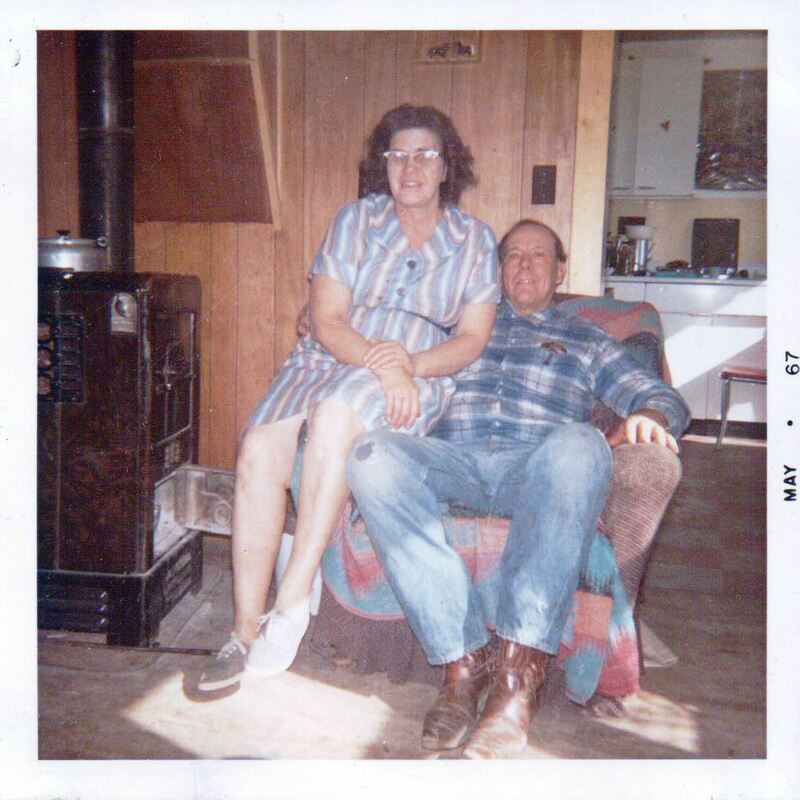 And this is just the beginning, there will be more to come…..and about Grandma Clarice and my other grandparents as well. I have never suffered from having an uninteresting family. Send the scans to me, as well, please! I remember going out with Mavis and Grandpa one time when he was staying in a small trailer and herding cattle on someone else’s land. Grandpa was anxious to see you so took Mavis on very ROUGH rides in his Scout to force you to join the world earlier than you wanted to come!